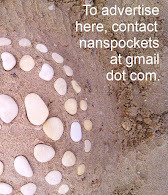 Things I've Found In Pockets: Book Review Of The Week... uh... Month! Book Review Of The Week... uh... Month! We are totally addicted to Percy Jackson! At first, we thought "Meh, a Harry Potter ripoff", but NO! Percy is a loveable character, the stories are really exciting, and best of all, there are tons of references to the Greek Myths which we love. Zeus and the Gods are in here, misbehaving as usual, and Percy has to sort it all out with the help of his rather unusual friends. I like the fact that Percy is ADD and dyslexic: he has a hard time reading plain English, but Greek is a cinch! And battling mythical monsters, you need to be a little ADD. Chas and Sam have been reading the series while eating, walking, dressing and even in the bath (we bought these: reading library books in the bath is not allowed...) They cannot put these books down. And I'm on book two. Now, we need to borrow all of the Greek Myths from the Library again, for some more background! Tales From Hans Christian Andersen, collected by Naomi Lewis, features some of Andersen's lesser-known stories. These Fairy Tales will delight children of all ages. 'The Emperor's Nightingale' is lovely. 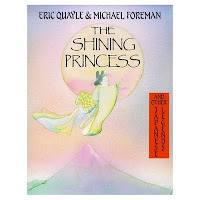 The Shining Princess and Other Japanese Legends : By Eric Quayle, beautifully Illustrated by Michael Foreman. We've read several collections of Japanese stories lately, and this was one of our favourites... partly because of the illustrations! 'Danny the Champion of the World', by Roald Dahl. A wonderful story! I remember laughing aloud over this, and the boys love it too. Keeps copying my work , Miss. The poems are all about the misadventures of pupils and teachers... a great gift for teachers in your life, and fun for reading aloud to your school-age boys and girls. We're also on to book three in the Narnia Stories: Prince Caspian (it's three if you read 'The Magician's Nephew ' first) (which I recommend doing, if you've seen the movies) This is the millionth time we're reading this series, but Max doesn't remember them well and Chas and Sam are loving the re-telling. We usually read another (short) story and then a chapter or two of Narnia. Depending on our mood. This makes storytime lengthy, but by the end of it, everyone's ready to sleep. Including me! Okay, I thought Percy Jackson was a Potter ripoff too, so now I'll try it per your suggestion. I have FIVE books on tape for this weekend's car ride to the Twin Cities (10 total hours!) and the boys are excited to listen with me. That will be fun! I like me some Roald Dahl. Percy Jackson books get the thumbs up from us. My eldest put the book in my hand and sat on me 'til I read it 'cause I wouldn't believe it wasn't a Potter ripoff, but the movie SUCKED! Made up for that by going to see Alice in Wonderland...totally ROCKIN movie!!! (Loved the tart-stealing feigning-innocent frogs). What enticing books would you recommend for 'leaning towards biology, but don't want to shove too much techy down her throat in case it turns her off' almost 9 year olds? WE are totally addicted to Percy Jackson too! I had a chance to order something thru amazon w/o int'l shipping (long story) and got the first 3 for Ilsa for her bday. She devoured them in about a day, then I read them, and now Abel and I are reading them together, just for fun. The problem? Do you know how the third one ends? ANd no way of getting the fourth one here, and they're not even OUT in French yet! AUGHHHH! PS Can you imagine a more painless way to learn Greek mythology? The man is a genius! I've just been to the library and borrowed MORE books on Greek Mythology, which is the current craze here now thanks to Percy Jackson. PlanetNomad, I FEEL YOUR PAIN!